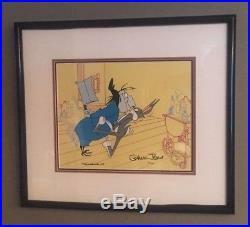 BUGS BUNNY AND WITCH HAZEL Animation Cel. Limited Edition #129 of 200. 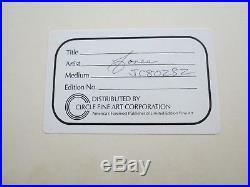 Include Certificate of Authenticity signed by Linda Jones. This hand-painted limited edition animation cel features Bugs Bunny and Witch Hazel. The cel, including the frame, measures approximately 17x20 inches. 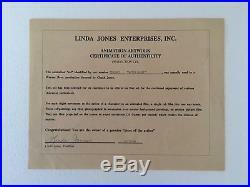 The cel includes a certificate of authenticity signed by Linda Jones dated 10/13/89. The cel is in good condition. It hung on display for several years and has been stored in a dry, dark location for the past 10 years. 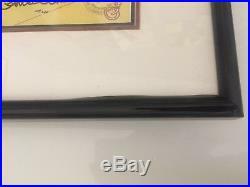 The bottom of the black frame is slightly warped and pulling away from the glass (see last photo). The Certificate of Authenticity has a small water mark. Please refer to the photos of the actual item for its condition. Cardboard corner protectors have been placed on the corners. The COA was placed in a cardboard folder and taped to the framed cel. H owever, please note that. The final charges appear at checkout. Ou get international tracking at no additional charge and y. I make every effort to photograph and accurately describe each item I post. I will do my best to answer your questions. Please check out my other items. The item "Bugs Bunny and Witch Hazel Animation Cel #129/200 Signed by Chuck Jones with COA" is in sale since Monday, October 8, 2018. 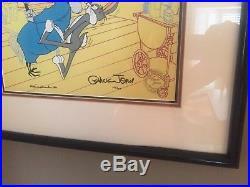 This item is in the category "Collectibles\Animation Art & Characters\Animation Characters\Warner Bros. The seller is "earlaroo22" and is located in Tarzana, California. This item can be shipped to United States, Canada, United Kingdom, Denmark, Romania, Slovakia, Bulgaria, Czech republic, Finland, Hungary, Latvia, Lithuania, Malta, Estonia, Australia, Greece, Portugal, Cyprus, Slovenia, Japan, China, Sweden, South Korea, Indonesia, Thailand, Belgium, France, Hong Kong, Ireland, Netherlands, Poland, Spain, Italy, Germany, Austria, Israel, New Zealand, Singapore, Switzerland, Norway, Saudi arabia, United arab emirates, Qatar, Bahrain, Croatia, Malaysia, Panama, Jamaica, Barbados, Bangladesh, Brunei darussalam, Bolivia, Ecuador, Egypt, French guiana, Guernsey, Gibraltar, Guadeloupe, Iceland, Jersey, Jordan, Cambodia, Cayman islands, Liechtenstein, Sri lanka, Luxembourg, Monaco, Macao, Martinique, Maldives, Nicaragua, Oman, Pakistan, Paraguay, Reunion.